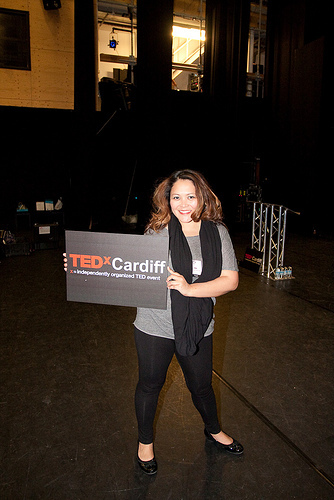 Anyone who knows me, or follows me on Twitter, will know that on Wednesday night I co-organised TEDxCardiff in Wales Millennium Centre. It was an evening of talks and performances by brilliant people from all over the UK. People travelled from as far away as Bournemouth and York to be in the audience. We had people watching live online in far-flung places such as America, Portugal and the middle east. And the whole thing was pulled together in our spare time by Claire and I, with the help of a small handful of brilliant volunteers. 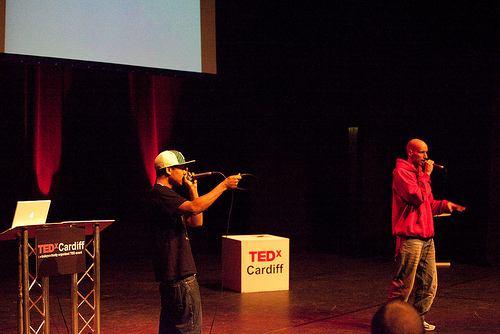 TEDxCardiff is part of a scheme run by TED.com, that allows people to run TED-like events in their own city. If you’re not already aware of it I’ll leave you to discover the brilliance of TED in your own time. It’s basically a conference where brilliant people deliver amazing, courageous, jaw-dropping, inspiring talks. I’m really looking forward to the talks from our event being edited and going up online so I can share them with those who couldn’t join us on the night. And so I can watch them all again in a more relaxed state! Firstly, I want to personally thank the speakers and performers for generously giving their time and expertise to give us such an entertaining and inspiring evening. And the sponsors who were so generous with their time and resources. And finally our amazing volunteers who painted, carried, filmed, stapled, ran, bought, designed, created and worked for many, many hours. I am truly in awe of all of them for their commitment. 1.People’s capacity to commit their time for nothing in return, other than to be involved with such an event, is nothing short of amazing. The speakers, sponsors and volunteers all have my undying admiration. 2.If we do this again, we need a bigger team. It was just too much for Claire and I to do just on our own. I took most of the week off and put 45 hours of work into in just the first 3 days this week, and the day itself was incredibly stressful. And things such as press and PR just fell by the wayside while we concentrated on the practicalities of making the event happen. 3.People who don’t pay for tickets, or pay very little, don’t value them as much and are much more likely to not turn up. We had an overwhelming demand for the tickets (they sold out in record time), but on the night we had empty seats in both sessions, which was a real shame, knowing that there were other people who would loved to have been there. 4.The decision to hold the first session at 5pm might have been a little flawed. It’s a bit too early for people to get there from work (and may have accounted for some of the empty seats if people were held up in the office), they haven’t had a chance to get changed, eat, and have a chance to unwind before coming along. 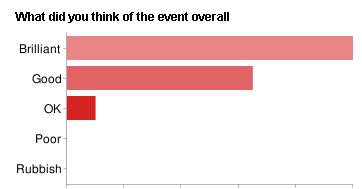 That’s possibly why the second session crowd was bigger, and seemingly more responsive. 5. Maybe a Saturday session is the way to go in future. We could do a longer day, with bigger breaks, and some breakout sessions to give people more chance to mingle and “network”. 6. The person who develops a universal presentation software format will earn a fortune, and I’ll personally give them everything in my bank account (£4.67). It was by far and away the biggest source of headaches over the course of the evening. And without DK and Andy, it would have been twice as hard! 7. We probably need to communicate the restrictions of the TEDx format a bit better. 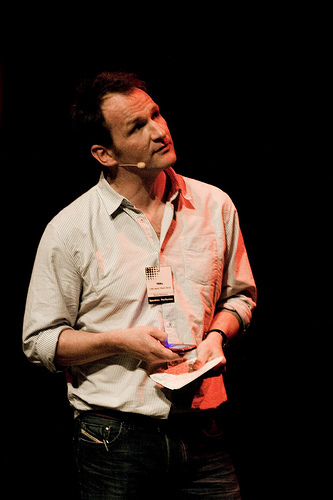 The feedback we had often mentioned a desire for Q&As with speakers. Something which the TEDx license doesn’t allow us to do, for example. I’m quite happy with that graph, of course! Photos courtesy of Ali Gibbs and Rob May. Plenty more here! And finally, our speakers – DK, Matthew Cashmore, Paul Clarke, Tara Busch, Dave Haynes, Steve Robinson, Wendy Sadler, Ruffstylz & Beatbox Fozzy, Jo Taylor and Robert Simpson. A job very well done Neil (and Claire). A big undertaking, delivered in style. Looking forward to 2011. Cheers for the write-up. Pity I was away and couldn’t make it. On point 6, what were the problems with the presentation formats? Carl – PC vs Mac, PPT vs Keynote, Keynote 8 vs Keynote 9, PPT vs OO etc. Just meant a lot of swapping of laptops, when it would have been nice to just have one laptop that all speakers could load their talks onto from their respective USB drives. Neil, I suppose you could relieve the pressure by having an advance deadline for presentations to be delivered? We did. We always do for all our events. It doesn’t ever actually mean that half your speakers won’t turn up with a USB stick 15 mins before the event starts. No matter how many times you chase them up…. Pingback: Gnat Gnat · Too small to have an impact? Try sleeping with a gnat in your bed!